Eve Kendal has been battered by circumstance. Though she married for love, her family thought that she was marrying beneath her station. They disowned her for marrying Ben, an army captain, instead of an earl. However, the couple is able to forge a new life in India and they are quite happy—until a natural disaster results in Ben’s death. Eve expects to be able to live on her widow’s pension and the savings that she and Ben have accumulated. When the money is not forthcoming, Eve decides to return to England and count on the largesse of her friends. 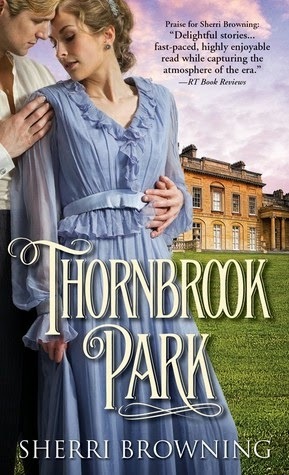 Such is the setting for Thornbrook Park by Sherri Browning. In 1906, there was not much choice for financially strapped women but to impose upon their friends for help (unless they were ready to work as a governess), so when Eve writes to her friend, Sophia, she is pleased to be offered a place to stay at Averford House. Averford House is the dower house that is near to Sophia’s estate, Thornbrook. When Eve arrives she is delighted to relax in comfort—until a commotion on the hall alerts her to the presence of Captain Marcus Thorne, Sophia’s brother-in-law. Marcus is haunted by his past as a soldier and suffers from frequent black rages. He is able to control these through forays into the prizefighting ring. When he loses a fight, he returns to Thornbrook, drunk as can be. In the throes of a flashback to the war, Eve ministers to him and seeks to provide comfort. Flash forward and both Marcus and Eve are at Thornbrook. Lady Sophia, who wishes that Marcus would marry her sister, Alice, threatens their budding romance. This would keep the family close by and provide that any children from the union would remain near. In addition, Eve needs to solve the mystery of her missing funds. She seeks the help of a lawyer, who is mysteriously murdered. Her quest to find out about her money, as well as to honor Sophia’s hope that Marcus marries her sister, forms the rest of the novel. While I found Thornbrook Park to follow a predictable romance novel formula (boy meets girl, obstacle, obstacle, life threatening event, happily ever after), there is one thing that Browning did quite well. When Marcus and Eve sleep together and are ruining Sophia’s plan to get her sister, Alice, married off to Marcus, both characters do the right thing—and confess their relationship. While this led to complications for the both of them, they did it anyway. This avoided “the great misunderstanding that can be solved with a conversation” that is present in a lot of romance novels. I found that quite refreshing. The rest of the novel is pleasant, if not predictable. The last third of the book, in particular, follows the standard romance novel arc with an appearance by the villain and a blessed event. There were no surprises there. If I had to grade Thornbrook Park, I would give it an average grade. It was nothing remarkable, but it was a fun diversion. i'm interested in this one just b/c of the time period, thanks for your honest review! !